Everest Short Trek is the mini hiking package of Everest Base Camp Trek. Instead of heading towards to the base of Mount Everest you will be returning back to Lukla from Tengboche. This Everest mini-trek is the shortest, sweetest, and easiest trekking trip that offers a close-up view of the world's highest peak, Mount Everest (Sagarmatha) just in few days from Kathmandu. Every trekker might not have enough time to attend the full trekking to the base of Everest despite their great craving. Considering such situation, Everest Short Trek emerges to satisfy those travelers. In this Everest View Short Trek, you will be hiking up to the Tengboche Monastery from where the magnificent view of the earth's highest rocky peak, Mount Everest can be observed. The trip begins with an adventurous flight to the one of world's dangerous airport, Lukla also known as Tenzing–Hillary Airport. On the same day, four hours of walking reach Phakding Village. Next day hiking will be entering into the Natural World Heritage Site, Sagarmatha National Park. This day, six hours of steep walking takes you to the capital of the Sherpas, Namche Bazaar. Halt one overnight in this wonderful village for proper acclimatization and explore the nearby museum and villages. On the fourth day of this trip, the main and final destination of Everest Short Trek, Tengboche will arrive. Visit Monastery and become face to face with Mt. Everest and back to Kathmandu following the same route. Day 01: Fly Kathmandu to Lukla and trek to Phakding. Trail Attractions: Panoramic Mountain Flight, Dudh Koshi River. Walking: 7/8 km, 4 Hrs. Max Altitude: 2,652 m / 8,699 ft (Phakding). Day 02: Trek to Namche Bazar. Trail Attractions: Enter into Natural World Heritage Site (Sagarmatha National Park), Stunning views of Thamserku Peak and the Kongdi RI Himal. Walking: 11/12 km, 6/7 Hrs. Max Altitude: 3,440 m / 11,283 ft (Namche Bazar). Day 03: Acclimatization day at Namche Bazar. Trail Attractions: Hike to Everest View Hotel, Explore nearby Museum and Village. Day 04: Trek to Trek to Tengboche. 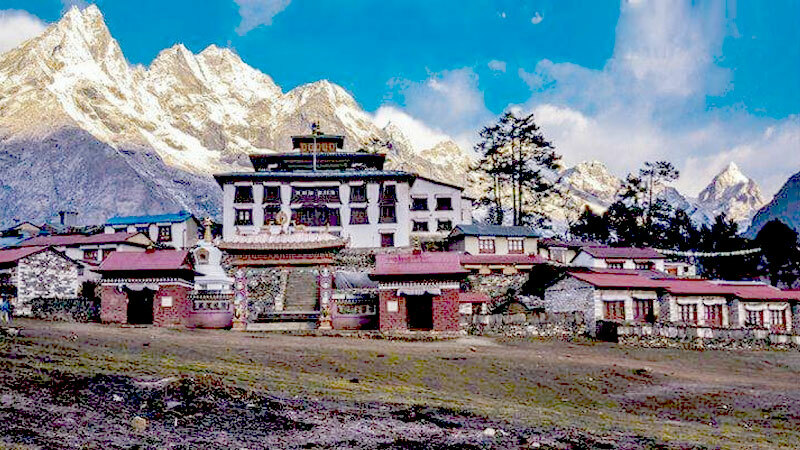 Trail Attractions: Tengboche Monastery, and a close-up view of Mt. Everest. Walking: 10/11 km, 5/6 Hrs. Max Altitude: 3,860 m / 12,660 ft (Tengboche). Day 05: Trek to Monjo. Day 06: Trek to Lukla. Day 07: Fly to Kathmandu. Drop to your hotel. Short Everest Trekking finished here! Wants some modification on Everest Short Trekking itinerary? contact us to customize it.